I got out today with Carla. She is fast. Not just kind of fast, but the fast that gets me into trouble. Our usual running group was emailing about weekly group runs and Carla mentioned she was getting out today over lunch. I let her know I was getting out as well and could use the company, but that my plan was to run an "easy" 70 minutes today. My easy pace is about a 8:30 miles. Carla replied back with "your easy is my tempo run!" With that, I decided to run with Carla over lunch. We decided to run park loop in reverse. The route would take us up an incline of about 2 miles before a 1.5 mile descent. Not a hard route, but just enough inclines to give a solid workout. We began to chat and, 8 miles later at an 7:50 pace, I discovered my easy run was no longer easy. I'm trying to strictly follow my running plan as Lean Horse gets closer. 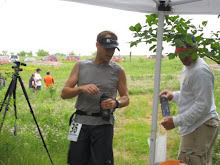 With a 50 mile race just ahead, it is important to follow the planned runs. Oh well - it felt good to go that pace - isn't that what running is about? Carla told me a funny story over the run. Quick background: Carla is beginning to run over lunch more and more and is introducing herself to some the usual downtown noon runners. Matt (another usual downtown runner and my cousin) spotted a couple of women that are fast and told Carla to introduce herself to see if she could run with them occasionally. Carla: Hi, I'm Carla - I'm beginning to run more over lunch and notice that you get out quite a bit. Are you training for a marathon? Lady: Honey, I'm always training for a marathon. Carla: Oh, okay....well I'm training for one and was just curious about your training. Do you have any goals for an upcoming race? Lady: At my age, honey, I don't run for time anymore.....are you training for your first marathon? Carla (a little uncomfortable now, decided to lay out her credentials to show the lady that she is a dedicated runner) Oh no, I've done a few. I ran Des Moines last year to qualify for Boston, and ran Boston this spring. Not as fast as I would have liked, but a still a pretty good time. Lady:I'm hoping to get to Boston in 2010. It will be my 5th Boston marathon. I've completed 73 marathons and 6 ultras. Moral of the story - be careful who Matt tells you to introduce yourself too.